The internal buzz these days among interior designers is that our livelihood is being seriously threatened. The fact is, the business of Interior design is undergoing a seismic shift. Less than twenty years ago interior design was primarily a service for the wealthy. In order to access one of a kind or trade pieces you had to hire an interior designer. Not so today. Enter HGTV, and a multitude of designer furniture online resources.Every day it seems like a new online retailer is popping up that allows the consumer to decorate their home simply by answering a few design preference questions. A few clicks on your phone, then sit back and wait for your personally curated decor to arrive. In reality though it’s not that simple or easy. One benefit to me is that this shift has caused is a big uptick in my “in home” design consulting services. Originally, I assumed people were calling me for a consult because they couldn’t afford full service design. That is certainly still true in many cases. What I am finding though is just as often it has nothing to do with the money. The clients that call me for a consult simply enjoy the process of decorating their own home. I understand that because I was the exact same way. 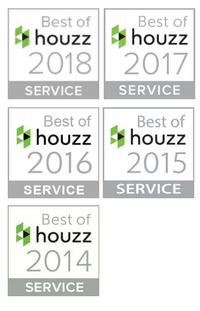 Many clients hiring me for a consult are very design savvy. They read design blogs, are familiar with online furniture websites and know so many “trade” vendors that I forget I am not talking to a designer friend. They love hunting down a unique item online and don’t mind spending the time doing it. What this new type of client lacks though is design training and experience to pull everything together. That’s where I come in to share my expertise. During the consult I give them guidance and a road map or plan to complete the space. 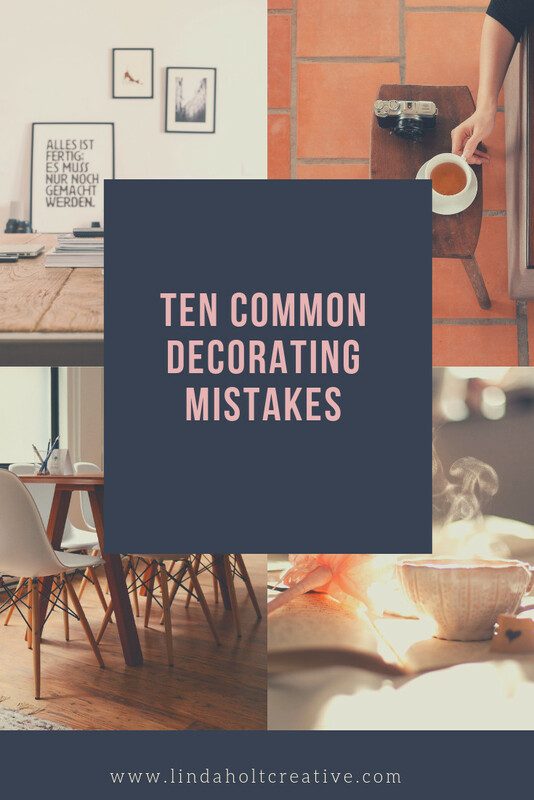 After going on over fifty consults I have identified ten common decorating mistakes that I see during my in home design consults. Without doubt, color is the biggest thing I find people get wrong. Color is not easy and most homeowners are not skilled in choosing color. One common decorating mistake I see is that the client has chosen the wall color first before anything else is in the room. This usually happens after buying or building a new home. Obviously it’s easier to paint before moving into the house. The problem though is that the homeowner is basically choosing color blindly. They choose a color from a tiny chip at the paint store. Once they move in, they see that the wall color doesn’t relate to any of their existing furniture. This is where it really pays to have a color expert come in and advise on color before the mistakes are made. It’s a much smaller investment to get color guidance first, rather than buying new furniture or repainting the walls. 2. Getting the scale wrong. Sadly I see this much too often. A homeowner falls in love with a sofa or sectional in a furniture showroom. Once delivered it doesn’t look right. It might fit against the wall but the scale is wrong. Most homeowners know enough to measure the wall length to make sure the sofa will fit. It’s not only the length that must be considered but the depth and height of the back and arms. On the flip side,I see furniture that is too small and wimpy in a large room. A common mistake is that the homeowner either run’s out of money or under estimates how much furniture is needed to make these huge spaces feel comfortable. 3. Decorating around something you don’t love. I hear statements like the following a lot. “I don’t love the oriental rug (or whatever) but it was my mother’s (or it cost a lot of money) so I kept it”. The problem with decorating around something you don’t love is the end result is a room you don’t love. I am a huge believer that we should only live with things that bring us joy. No matter who once owned it, or how much something once cost (a big sticking point) it’s not worth decorating around it and having a room that doesn’t feel good to be in. Even with the popularity of Marie Kondo’s Netflix show and the decluttering band wagon everyone seems to be on, I often see rooms that are over decorated. It’s not my intention during a consult to rid anyone of their stuff. What I can do though is help with editing. Too many furniture pieces, a dozen pillows on the sofa, or table tops that are jammed packed with decor is too much for the eye. Less is more with room accessorizing but the opposite is also a problem. Rooms that have no art work on the wall, no accessories or books feel dead. It’s a fine balance between over decorated and not decorated enough but something a professional can easily advise on. Often times when I go to a consult the client is stuck moving forward because they started to decorate with out a plan. A typical scenario is that they recently moved to a new home. They went out and bought a sofa and a couple chairs from a local furniture store (during a big sale). Next they purchased a coffee table from an online site. The coffee table was much bigger than they anticipated and is dominating the room. Then they ordered a rug through a popular rug website but when it arrived it didn’t quite look like it did online. A family member then gifted them some vintage side tables and lamps. Now this client is struggling to make everything work together. By the time I arrive for the consult they have metaphorically painted themselves into a corner. Decorating piecemeal or buying things one at a time is the most difficult way to decorate. Making a plan first with measurements and fabric swatches will insure that less mistakes will be made. Just as in a good photograph, a room needs a clearly defined focal point. Without a focal point the room lacks balance and harmony. A common focal point is a fireplace or a wall of windows with a killer view. If the room has no focal point then create one. A few ideas are an accent wall, a large piece of art, wall shelves or a beautiful built in. Once the focal point has been established then you can get down to the business of arranging the furniture to feature it. Gray, white, greige, cream, taupe…all safe colors and all very beautiful. The problem is when they are chosen out of fear and not out of desire. I have been on many consults where the room is completely devoid of color because the homeowner was too scared of making a mistake. They end up with a room of bland neutrals and tell me they don’t love the room. It’s very easy to add color with pillows, carpets and artwork but don’t be afraid to buy that emerald green sofa or the blue velvet side chairs. I have never once had a client tell me they regretted a color purchase. It’s usually just the opposite. After a couple years they are bored with the oatmeal colored sofa and the beige club chairs. If you follow design you know that white rooms, especially kitchens, have been all the rage for the past five years or so. The look is great if you have huge windows that let in tons of natural light and have an open modern home to go along with it. Where I live near Boston these all white rooms rarely look good in the typical New England Cape or Colonial home. Think carefully before you blindly follow a trend and assume it will look good in your home. Keep in mind that trends come and go. This past January at the Kitchen and Bath Show in Vegas, the previously popular all white kitchens were “out” and stained wood cabinets and bold color is back in. Decorate with what you love in your unique style and not because of what the design magazines, IG and Pinterest are showing you is currently “on trend”. Outdated worn furniture, twenty year old drapery valances, baby photos on the wall when the children are grown and gone. All these things serve you no purpose today and worst, keep you stuck in the past. Fear of letting go often comes down to excuses of cost or guilt. “Those drapes cost thousands of dollars”, or “even though I don’t like (X) my friend gave it to me”. My favorite is ” but that chair is still really comfortable”. Comfortable maybe, but with torn and dated fabric and hideously ugly too! The money you spent years ago will never come back and your friend will understand if she is truly a friend. GET RID of old dated belongings that you no longer love. It is truly life changing and will allow you to move forward to a happier home. I have been on two different consults in the past month where the homeowner furnished every room in their home from a single store. The furniture, carpets, accessories and even the art work was all purchased from one very recognizable branded store. I felt like I had walked right into the store or stepped into the catalog. Both homes looked lovely but both homes reflected nothing about the family that lived there. In order to give your home a soul, mix it up. Shop not only at different stores but try to incorporate a mixture of new and vintage pieces. Decorate with items that reflect you and your family and don’t let the marketing department of a big box store dictate how they think you should live. If you have made one or more of these mistakes please take heart. I will admit to making several of these mistakes over the years in my own home. One of them, mistake #1, I even made twice! 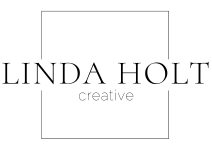 If you love to decorate but feel you could use a little guidance or a plan please reach out to me HERE. I love doing consults and I bring huge value in a short amount of time. Here is comment from a recent consult client. Awesome post, Linda. SO, so true. I see these mistakes ALL the time. What’s best is when DIY home decorators call for a consult before they make those big purchases, get a consult to help them make a plan so they don’t waste a lot of money on interior decor they don’t love. I think we all do see these common mistakes. One reason why I love doing consults so much as that I feel so good knowing I have either fixed one (or more) of these problems or prevented them from being made! Great post, Linda! 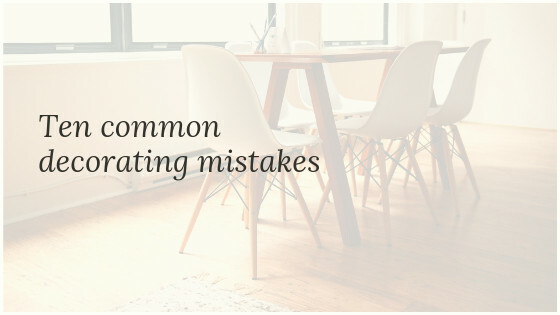 I think we have all done at least 2 of these “mistakes” along the way- I love that you are empowering us to course-correct and help us find a home we will love! Thanks Meredith! It’s so easy to make one of those mistakes, even for a professional! I think you nailed it. Especially loved the don’t shop all in one store. Spot on! Although would clarify for me it is wall color- not necessarily a color palette in general- but the rest are so true. Oh yes, so true. I see the wrong wall color in probably 95% of the homes I visit. ThanksVeronica, Sadly, I think we all do. Gosh, what a great post, couldn’t agree more! Thank goodness your clients have you to help them wade through this process. I had no idea about white kitchen cabinets generally not working in your area, but since you pointed it out, that makes total sense! Thanks Jil! White kitchen cabinets are absolutely fine. It’s the all white rooms with white walls, white furniture and carpets. Thanks Sandra! I’m doing well. We moved to Stoneham. 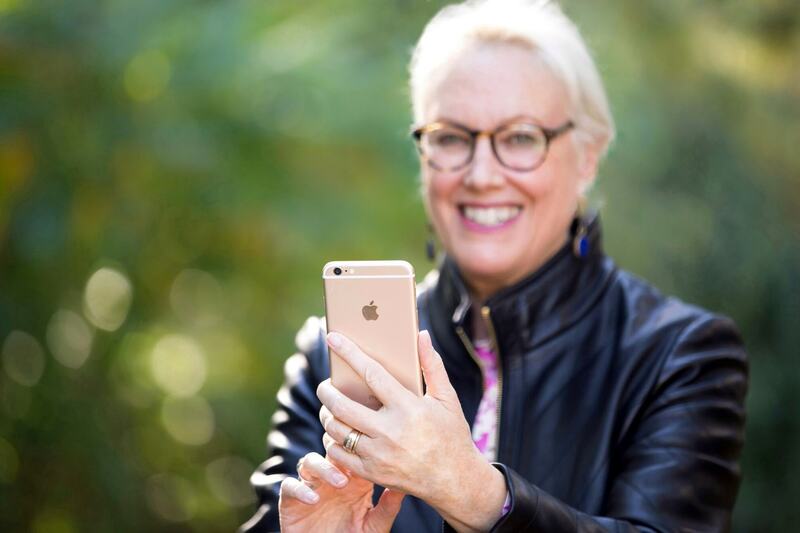 I plan on connecting with you because I want to take one of your floral arrangements class. Amen to all of it! Great post as usual! what I like about the article, for people like me who don’t know much about decorating, is that there seems to be a process to it. Would love to see some examples of decorations that follow these guidelines and compare them with some that don’t, with the mistakes. Do you have such a comparison post?